To learn more and get started --- click here ! To learn more about Teen fees --- Click Here ! please note, Teen students train in the Teens / Adult beginner classes every Tuesday, Thursday night & Saturday morning. The Teens class is a dynamic high action class starting with a hard warm up and conditioning. After this Head instructor Daniel Cherubin teaches a technique, The students will have time to drill the technique and ask any questions they need answered about the technique and Jiu Jitsu in general. 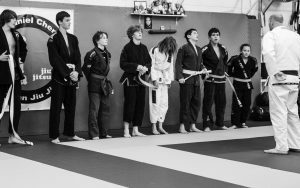 Our teens quickly learn along side our adult beginner members and are also welcome to all adult classes on the DC Jiu Jitsu weekly time table they develop their Jiu Jitsu at a rapid pace. Teen members pay a fortunately fee witch allows them to train all year round, including holidays.